We [heart] cheesecake. Every October, we switch to pumpkin cheesecake in its many forms. But as soon as the Thanksgiving leftovers are gone, we start baking cranberry cheesecake recipes. Because cheesecake is such a rich and heavy dessert, we usually don’t serve it following a big dinner, but as a “tea time” snack (and honestly, we’ve been known to eat it for breakfast). The first recipe is a plain cheesecake with a cranberry topping, analogous to cherry cheesecake. The second recipe has a different look, with a cranberry swirl inside the cheesecake and a thin layer of cranberry gelée on top. Both recipes are made in a nine-inch springform pan. A nine-inch cake yields 12 slices. 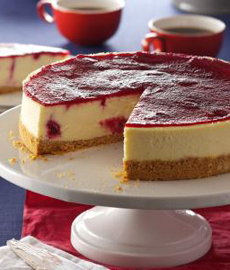 This recipe (photo #1) is Philadelphia Cream Cheese’s classic cheesecake, with a cranberry topping. The result is the cranberry version of a cherry cheesecake. Like cherry cheesecake, but with a cranberry topping. Photo courtesy Kraft. 1. HEAT the oven to 325°F. Mix the graham cracker crumbs, 1 tablespoon sugar, ½ teaspoon cinnamon and the butter until blended. Press onto the bottom of a 9-inch springform pan. 2. BEAT the cream cheese and 1 cup of the remaining sugar in a large bowl with a mixer, until blended. Add the eggs, one at a time, mixing on low speed after each just until blended. Pour over the crust. 4. BRING the cranberries, water, remaining sugar and cinnamon to boil in a saucepan on medium-high heat. Reduce the heat and simmer on low for 8 to 10 minutes, or until the sauce is slightly thickened and the berries have softened; stir occasionally. Cool slightly; thrn refrigerate until ready to serve. 5. SPREAD the cranberry topping over the cheesecake just before serving. 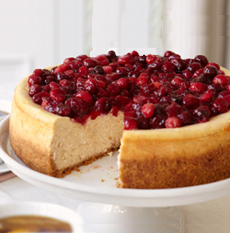 Cooked cranberries are swirled into the cheesecake and puréed into a gelée topping. Photo and recipe courtesy Taste Of Home. Fresh cranberries (photo courtesy Ocean Spray). In this recipe from Taste Of Home (photo #2), cooked fresh cranberries are swirled through the batter; and then strained in a food mill or sieve to create a gelée topping. Prep time is 30 minutes, cook time is 55 minutes plus chilling. 1. PREHEAT the oven to 325°F. Place a greased 9-inch springform pan on a double thickness of heavy-duty foil, about 18 inches square). Wrap the foil securely around pan and place the pan on a baking sheet. 3. COMBINE the cranberries, sugar and water in a large saucepan. Cook, uncovered, over medium heat until the berries pop, about 12-15 minutes. Add the lemon juice. 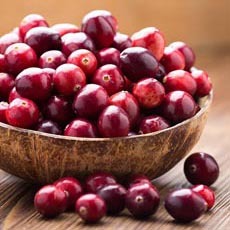 Press the cranberry mixture through a food mill into a small bowl; discard pulp and seeds. Set aside. 4. MAKE the filling. In a large bowl, beat the cream cheese, sugar and lemon juice until smooth. Add the eggs and beat on low speed until just blended; pour into the crust. Spoon 1/4 cup of the topping over filling. With knife, cut through the filling to make a cranberry swirl. 5. PLACE the springform pan in a larger pan and add 1 inch of hot water to larger pan. (This creates a water bath, or bain-marie, which adds moisture to the oven and keeps the top of the cheesecake from cracking.) Bake for 55-65 minutes or until the center is just set and the top appears dull. 6. REMOVE the springform pan from the water bath. Cool the cheesecake on a wire rack for 10 minutes. Loosen the sides from the pan with a knife; remove the foil. 7. COOL for 1 hour longer. Pour the remaining topping over cheesecake. Refrigerate overnight, covering the cheesecake when it is completely cooled. Remove the rim from the pan.